1873. When Carrie Manning’s father dies her mother, Esther, is heartbroken. 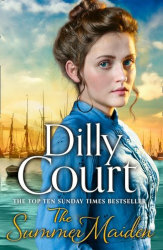 Essie leaves London to convalesce with her good friend Lady Alice, and it is down to Carrie to look after her family and take charge of the shipping company that her father has left behind. But the company is in dire straits, forcing Carrie seek work as a companion to Maria Colville. When Carrie and Maria try to track down Maria’s mother, they have no idea of the secrets that they will discover. Secrets that link the Colvilles, the Mannings and figures from the past who return to England. Carrie’s journey is as unpredictable as the waters that link the rival shipping companies, but will her determination be enough to preserve the legacy of her family’s name.